Dependable Exterminating offers Skunk Trapping and Skunk Removal Services in New York City NY, Westchester County NY, Rockland County NY and Orange County NY. We specialize in Trapping Skunks and will make sure your home and property are Skunk Free. Let Us be your Skunk Control Company. Call Us Today. 1-844-305-8999. Skunks can certainly be a nuisance to say the least. They are harmless; however, they can cause serious damage to a property while foraging for food. Skunks have strong forefeet and long nails, which make them excellent diggers. 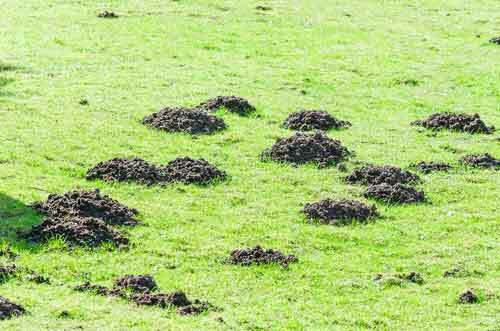 They dig large holes in lawns causing extensive damage. Skunks are omnivorous and feed on a wide variety of food sources. They are second to raccoons in carrying and transmitting rabies. Skunks, if startled or cornered will defend themselves. Their first attempt to defend themselves will be by hissing or by stomping their feet. Raising their black and white tail is another way of sending a message to stay clear. During the months of April and June the skunks begin raising their kits. When the kits mature and reach juvenile status they will begin to accompany their mother foraging for food. This is when the skunk will spray you offensively and without warning. 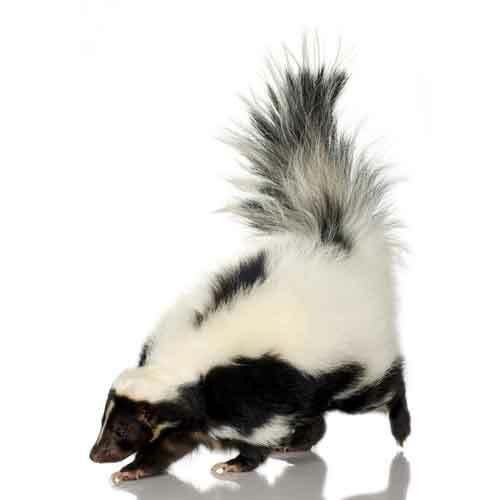 Skunks can spray you from 20 feet away and once they have a target, they very rarely miss. The odor removal process is time consuming and quite difficult to accomplish. Skunks raising their bushy black and white tail is their way of sending a message to stay clear. Our trained Skunk Control technicians will identify burrows in your home or business, we will setup Havahart traps to trap and relocate the Skunks. Skunk Trapping is an effective means to solving a skunk problem and our certified Skunk Trapping technicians can perform exclusion work to prevent other skunks from re-colonizing the area. Dependable Exterminating is a full-service wildlife and skunk control company that specializes in skunk removal. Give Us A Call Today. 1-844-305-8999.